I don’t know about you, but I’ve been craving comfort food lately. Maybe because I can finally turn the oven to 450 degrees without running the air conditioner on high for the next twelve hours! It must be a fall thing. Besides, I figure I’ve got a few more bike rides to fit in before it snows. I’m going to enjoy this splurge while I can. Prepped with a food processor, these mile high biscuits come together so fast your oven won't be preheated in time, so turn it on several minutes before you begin. Preheat oven to 450 degrees. Cover an insulated cookie sheet with parchment paper. If you don’t have one, double up two cookie sheets together. Place biscuits on cookie sheet and bake for 12 to 15 minutes until lightly golden on top. Makes 8 to 10 biscuits. Good sausage gravy is a guilty pleasure of mine. Break up sausage into a very large skillet or wide bottom pot. Cook over medium high breaking apart the sausage into small pieces. When no longer pink and well cooked remove the sausage from the pan leaving the grease behind and set the meat aside. Add butter and oil and stir occasionally until the butter is melted. Next, add the flour and cook for 3 to 4 minutes stirring frequently. Add the salt, pepper, and cayenne. Rub the thyme between the palms of your hands to crush it while adding to the pan. Slowly stir in the milk and bring it to a simmer stirring constantly until gravy is thickened to taste. Add the sausage back in and cook for a couple minutes to warm through. Season with more salt and pepper if needed and serve hot over biscuits. Recipes & Pictures by Laura Flowers. Snow...if only we were going to get some here in Austin! These look delicious, and this is by far my husband's favorite breakfast. Thanks for sharing, Laura! Ummm! I made some homemade biscuits yesterday with some Fineland butter, they had an odd but good taste, and some organic maple bacon...now I wished I had this! 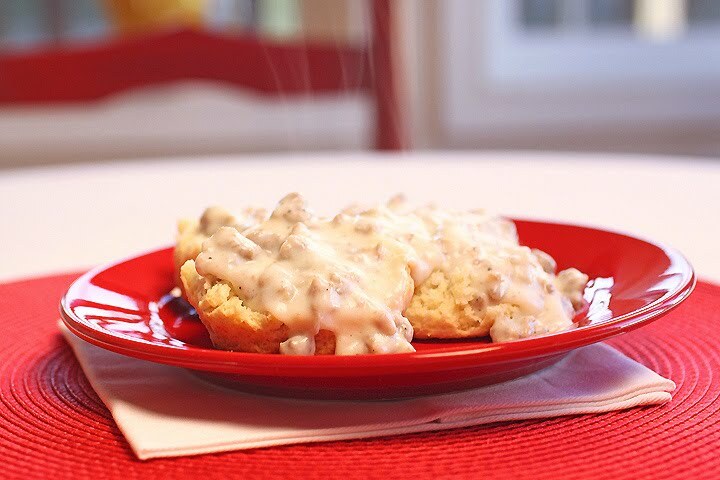 Oh my goodness, biscuits and gravy are one of my favorite comfort foods. How can you go wrong with carbs covered in meat and fat sauce? Seriously. I've never had true Southern biscuits and gravy, but I imagine it's like heaven on earth. Yes? Oh Laura, you are speaking my language. Biscuits and sausage gravy = religious experience. Just right up my alley! Looks good, Can't beat buttermilk biscuit and sausage gravy! Yummy! fantastic, I have this Xmas morning every year. I love the first picture. Is that steam coming off the gravy? YUM! Aaaaah, one of my ultimate comfort foods. Thanks for the recipe--I already know the biscuits rock but I'm sure this gravy is the bomb-diggity too--saved! Guilty pleasure times 10 - Hello!!! I should know better than to visit your blog before I've eaten breakfast. one of my favorites!! thanks for sharing the recipe. OMG the sausage gravy!! Yum! Oh Laura, you've got the Texan all kinds of fired up over this post. Seriously, I could eat "bickets 'n gravy" every single day. Takes me back to being in Texas and making breakfast with my best friends and serving our usual herd. This is also a favorite guilty pleasure at our house - My husband would ask for it everyday if he thought he could get away with it! Wow this looks incredible but one question.. how much sausage do you use for your recipe? It doesn't state the amount. I definitely agree about craving comfort food. This is a meal I make periodically for my boyfriend because he loves it so much. I need to remember to try this recipe next time I do. Oops sorry Lori. It's the whole package. Thank-you for making my gravy!! I am so glad you liked it. You made my night! Hi Laura, this is Diana from TasteSpotting! The gravy was perfect! I only made half the recipe since it was just for me and my hubs but it was delicious. Thanks so much for posting!